(Nashville, Tenn.) September 3, 2009 – Taking a singular vision of meshing Scripture-rooted lyrics with Americana music, artists involved with the making of Glory Revealed II recently wrapped up a 10-date run. Promoters reported sell-out shows in more than half of the markets including Nashville; Marion, Ill.; McDonough, Ga, Fairhope, Ala., Broken Arrow, Okla., and Birmingham, Ala. 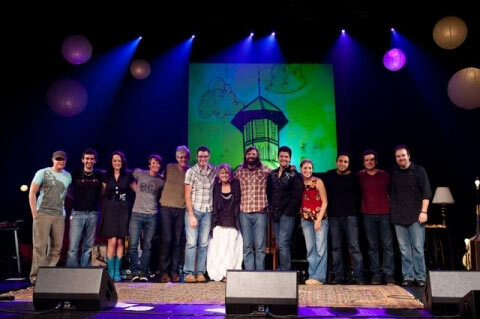 The Glory Revealed II Tour featured many of the artists and musicians who devoted time, energy, and talent to the project, including creator Mac Powell, co-creator David Nasser, artists Aaron Shust, Shawn Lewis, Trevor Morgan, Laura Story, Bethany Olds, and musicians Jason Hoard and Mark Wheeler. Highlights of the two-week run included special guests at the Nashville premiere, including Natalie Grant and Matt Maher, along with Crabb and Donehey, and Brandon Heath and Chris Tomlin performing at the sold-out Birmingham show. Casting Crowns frontman Mark Hall jumped on the tour for shows in Broken Arrow, Okla. and Benton, Ark., before welcoming the tour to his home church, Eagles Landing Baptist in Atlanta. Mark Harris also joined the show for the sold out crowd in Fairhope, Ala.
Each night, audiences responded to the charge led by Nasser for OneVerse, with donations from 550 fans which will provide full funding for the translation of the New Testament of the Bible into two languages. The troupe wrapped up this leg of touring with the taping of a two-hour music special for the Trinity Broadcasting Network, which will be broadcast Friday, Sept. 4 at 9 p.m. CDT. As a follow-up to their multiple Dove Award-winning 2007 release Glory Revealed: The Word of God in Worship, project visionaries Mac Powell (Third Day) and David Nasser (author/speaker) spearheaded the multi-artist worship album Glory Revealed II: The Word of God in Worship, released on July 14. Already delivering the No.1 radio single, “Since The World Began,” on the Soft AC/INSPO charts last week, the Glory Revealed II album continues to gain momentum. The Powell-produced project again blends roots-driven worship music with Biblical truth designed to musically stamp the word of God on the heart of listeners. The album features 12 original songs written from Scripture during a week-long artist retreat, with vocals from 21 Contemporary Christian, Southern Gospel and Country music artists including Mac Powell, Jason Crabb, Mark Hall, Amy Grant, Sara Evans, Shane & Shane, Natalie Grant, Matt Maher and Brandon Heath, among others. Forged from a creative vision shared by Mac Powell, front man for GRAMMY winning rock band Third Day, and acclaimed author/speaker David Nasser, Glory Revealed: The Word of God in Worship won two Dove Awards, spawned the No. 1 song “By His Wounds,” and inspired people around the world to sing Scripture. David Nasser’s book, Glory Revealed: How The Invisible God Makes Himself Known continues to be the perfect companion to these records. The 2009 installment, Glory Revealed II: The Word of God in Worship, brings 21 artists together to craft a new album sure to use musical creativity to plant God’s Word on hearts and minds of all ages. For more information on Glory Revealed II: The Word of God in Worship, please visit www.gloryrevealed.com.